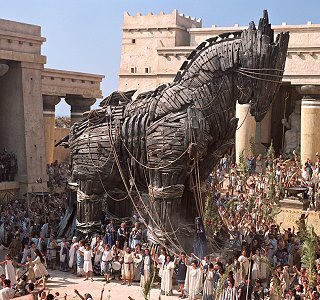 On this day in history: the greatest security breach in history – the Trojan horse! The strategy has proved so clever and effective, two thousand years later it is still being copied by computer viruses. The Trojan Horse was a sneaky wooden contraption that allowed the Greeks to put an end to the 10-year-old Trojan War. For ten years the Greeks had been trying without success to break through the high walls of the city of Troy. A Greek general named Odysseus, came up with a clever idea how to get into the city of Troy. He told his soldiers to retreat leaving behind a giant wooden object made to look like a horse at the city gates. Inside the huge horse were a number of Greek soldiers, including Odysseus. When the Trojans saw the giant wooden horse and the departing Greek troops, they thought the wooden horse was a parting gift for the gods, so most of them wanted to wheel it into their city. The wooden horse was move within the city walls as a war trophy. Unfortunate for the unsuspecting Trojans, the Greeks sneaked out of the the wooden horse during the night, attacked the Trojans and conquered the city of Troy.